The wonderful thing about doing this blog is the way one thing can lead to another. A map of coffee shops leads to thoughts of the design heritage of London Underground – not only the map but the instantly recognisable roundel, the architecture of Charles Holden stations and, perhaps above all, the typeface Johnston Sans. To me it is a consistent source of amazement that the font was designed as long ago as 1916, as it still looks fresh and is a million miles away from designs you would expect from the Edwardian/WW1 era. (You will see conflicting dates as to when the font was created, with some people crediting last year as the centenary but 1913 was the year Johnston got the design brief, he actually delivered it in two stages: block face in 1915 and full set in 1916). If you are at all interested in the history of the design and its evolution into the modern New Johnston (the original was only meant for display and only existed in metal or wooden blocks, and so was not fully adapted for the computer age), I would recommend this article. But the story of the importance of design is not today’s moment of pleasure. 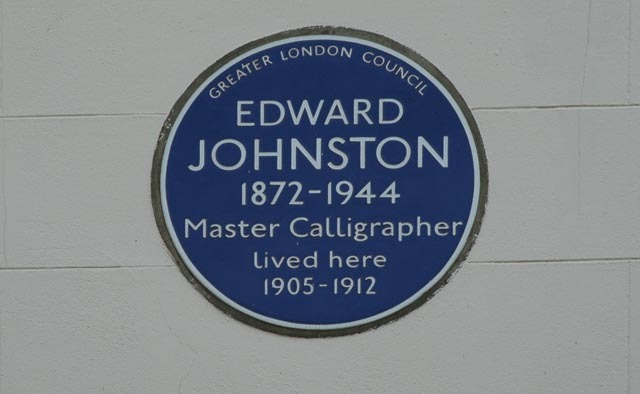 Instead it is learning that the Blue Plaque, which commemorates Edward Johnston is in his typeface. it must be the only plaque that is an actually example of the reason the person was notable. That sort of recursiveness is always amusing. This is about the feeling of calm you can get when gently and rhythmically your nicely laden paint brush strokes a piece of wood. You are alert and your eyes are looking carefully, controlling your movement, making sure you are accurate. 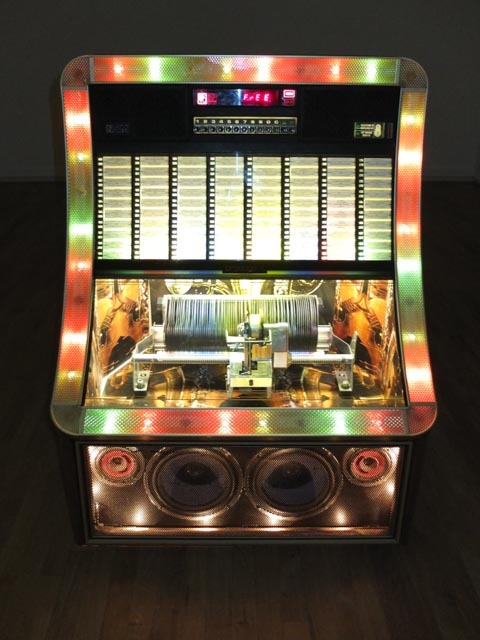 In the background a radio plays music, which you are aware of in a different part of your brain. For a short time nothing else exists. This feeling only really happens when you have a small job that is not going to take too long, where there is not the pressure of productivity and having to finish to a deadline – in other words a little bit of hobby diy, not work. This is rather brilliant and is well worth keeping for reference every time I visit London. The originator is Chris Ward, who has written a book on work outside of the traditional office which embraces the coffee culture. It is therefore right that he has researched far more coffee shops than I could ever get round to; but that is not the reason this is good. 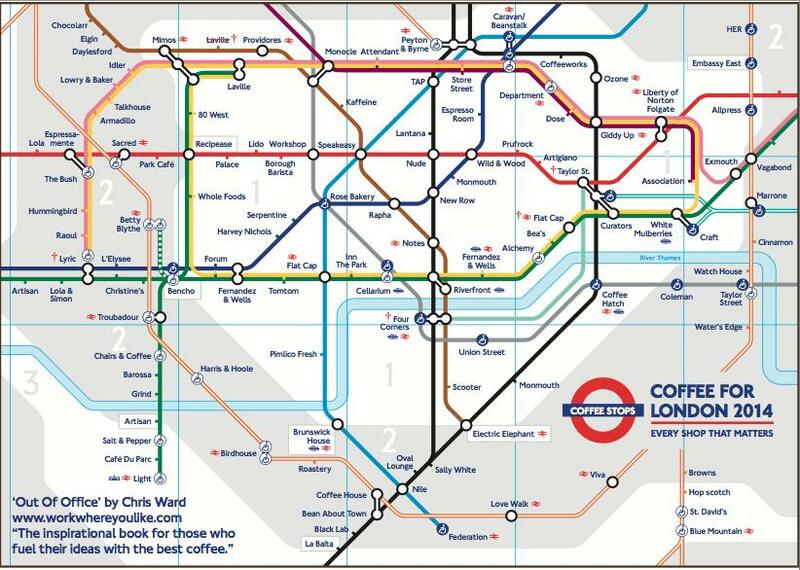 If it had just been a list I would have thought ‘OK a list of good coffee shops – that’s useful’ but the fact that he has used the tube map produces a much more vivid response. It is reminder of what a brilliant piece of design the original map was. So instead of the coffee I would like to salute Harry Beck and the moment of inspiration that led him to think of the tangle of tube lines in terms of a wiring diagram rather than a geographical map. (See this gallery of Underground maps). The weather continues to be grey, windy and extremely wet – horrible. However, even though we seem to have been oppressed by cloud and water for months, there are signs it will not always be so. 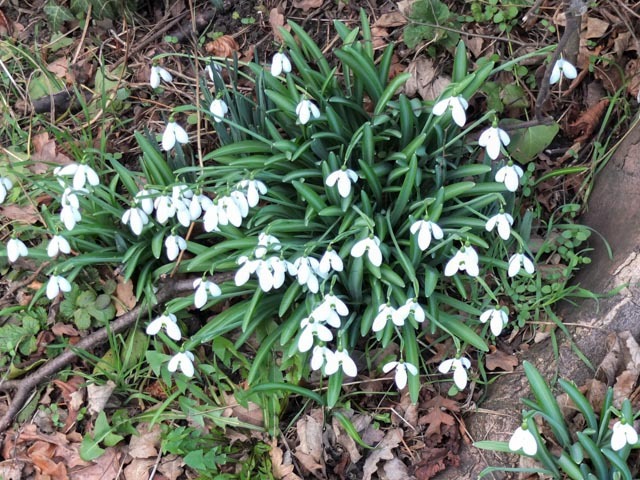 Walking back from Cambridge city centre towards Trumpington I passed a verge where snowdrops had come out. I always think of them as the first growth of a new year and a sign that spring will come (eventually). Yesterday I linked to an article on untranslatable words which had a lovely example that clanged a loud bell of recognition. There were some fantastic words that would arguably make welcome additions to English: who among us hasn’t experienced tsundoku, for example, the Japanese word for “the act of leaving a book unread after buying it, typically piling it up together with other such unread books”. Today I was in Waterstones, just looking round, picking up books, thinking ‘Umm that looks interesting’, when I suddenly clicked my mind into focus. ‘Tsunduko‘ I said to myself. 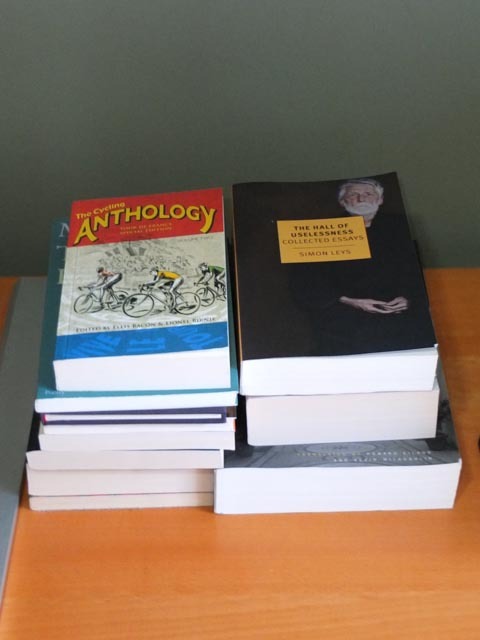 ‘you have several piles of books at home awaiting attention. Any more and you will crowd out your mental space and not pay full attention to what you do read because of the pressure of the unread’. So I walked away – it was a small moment of positive control. P.S. The picture is of the books on my desk. It is actually unfair to say they are completely unread. There are books of essays and a book of poems, which have been dipped into , but all of them need further reading. A couple of days after writing about loanwords for concepts that don’t exist in english I read this article in yesterdays Guardian. It is another example of those tiny threads linking things. First you notice something, then you notice something else. 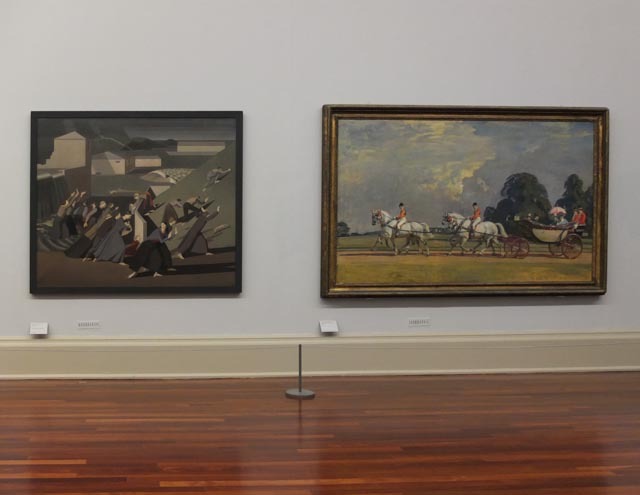 I went to Tate Britain and what do I bring back? A photo of my least favourite painting in the whole collection, that’s what! This might not seem to be an example of pleasure – but it is. It shows the fun that can be had when you revert to a chronological approach to hanging after years of a thematic straightjacket. The Munnings picture might be technically brilliant, as the horses are vividly depicted, but it is completely out of time and in some ways irrelevant. The aristocratic splendour harks back to a time before the war when Britain had the largest empire in the history of the world and pretends that things have not changed, when everyone knows they have. An excellent example of how something can be good (technically) and bad (conceptually) at the same time, it was painted 5 years after the one beside it (which might not be cutting edge but at least shows something of the spirit of the age). In fact when you look round this room of the interwar years you can see a huge fracturing of styles and you get a sense of the struggle of different artists to come to terms with a changed world order, both politically and artistically, after the great trauma of a war unlike any other. It is illuminating to see more than one approach. Art history is too often presented as a simple linear thread, a main highway if you like, and it is good to be reminded that there were other smaller roads (that might not have gone anywhere in particular) that offered a different view. This blog is partly about small continuities: you see something and you make an association with something else, and so on, and so on, until there is a rambling stream of consciousness. Yesterday’s post was called fug because it was about the moisture in a warm room condensing when it hit a large expanse of window. There is something cosy about seeing a window fugged up in such a way. From that though there is an easy connection with the word. The Fugs were a group, firmly embedded in the 1960s counterculture, formed in New York by poets Ed Sanders and Tuli Kupferberg with various musicians. In some ways if you want to know what the Sixties were about you could do worse than look at The Fugs. The never sold that many records or featured on any soundtrack of the age instead they typified a particular sensibility that fed into much of what happened at the time. They celebrated: creativity, freedom, vulgarity, energy, spontaneity, and were the opposite of polished professionalism.